CENOTE AZUL, Yucatan, Mexico: There is no Time. Cenote Azul. Outside of Chetumal. One of the most beautiful places I think I have ever seen, although perhaps it is just the magic of the moment. It is hours after my arrival I am having lunch after much swimming. They say El Cenote is 92 meters deep around the edge and at least 150 deep in the middle (it seems no one has ever gone deep enough to actually measure it). Its elliptical shape is 200-300 meters across, depending on where one measures. Simply said, it is a huge shaft in the limestone plate that makes up much of the Yucatán peninsula, and is filled with brilliant blue water. It is surrounded by thick jungle (at its banks the water disappears into the trees) except for an area cut out for the open-air restaurant where I am sitting. Directly in front of the restaurant is cement slabbing a few meters across on the edge of the water. And there is no "shore," no wading out to the depths; the cenote's walls are sheer and go straight down. I swam out into the middle of the water and dove down. Opening my eyes into its unfathomable depths (it is fresh water), I saw nothing but a very bright, royal blue color. Impossible to gauge distance away from the cenote's edge, it was like finding oneself in a room without any light: that sense of disorientation; of being in an abyss. Upon surfacing, I collided with an old memory. In the mid 70's I was at a friend's house on Bay Street in Santa Monica, California. One night he and his roommate had some laughing gas and were using it for amusement. I had never tried it and was interested in its effects. The first time I inhaled the gas, I held my breath, sat back in a chair and closed my eyes. In seconds a vision flashed into focus. The energy in my body flew up very quickly through the top of my head and out of the room; up and up through a brilliant, star-filled night sky. Then everything changed, and I was coming from the depths to the surface of a body of water. When my eyes cleared the surface of this water, I found myself in a lagoon surrounded by jungle. The sun was shining and I was completely alone. I was laughing and a voice said, "Welcome home." There were no signs of civilization - just the lagoon and tropical vegetation in brilliant late morning sun. Today, when I swam out into the middle of the cenote, I dove many times into that Blue World. On one of those dives I turned and swam the meters back to the surface of the water. Suddenly, the crash of recognition blew hard and fast from some far alcove of recollection and stunned like an electrical jolt - shocking in it's intensity. It was exactly like the vision from years ago. There was no voice this time as I looked at the jungle surrounding the cenote, but the sudden and unexpected memory (I hadn't thought of that visionary moment in decades) shook me uncontrollably with giddy laughter. I told myself it was impossible, yet another side of me kept saying, "SHHH. This is it." And the more I stayed there, I knew I had seen this before. As to how or why, I don't care. This is it. It is a fantastic place and I am still trembling. At times, life is a strange and beautiful waking dream when it bring us these astonishing experiences. Back in Santa Monica I knew nothing of the Yucatán, let alone a cenote. It is amazing and magical. It is awesome and glorious. It is the All. After a beer and a large plate of ceviche made from shrimp, octopus, conch and several other types of fish, I walked to the water's edge to say my good-byes. The color is so strange - it is an almost milky bright, royal blue, but very clear. Fish can be seen swimming many meters down and there is a whiteness that is fascinating. It is probably the reflection of light from the cenote's limestone walls. This was the first day I had been without my camera since I arrived in México this time. It had looked as if it were going to rain (late last night in Chetumal there was a wind-and-deluge of tropical downpour), and also I didn't know how safe it would be to leave the camera while I swam, so I left it at the hotel. As it turned out, there weren't any postcards in the restaurant or its tiny gift counter. When I told my waiter about the experience and how important it was to have a picture, he said it is magic and that the dream I had so long ago is still mine alone. A moving thing to be told. Basking in the energy of this natural beauty, I took my last look, said my prayers and thank-yous and walked out to the highway. Rev it up. Here we go. 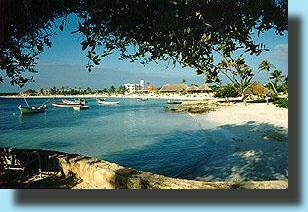 Akumal is an insulated, sophisticated, American-style get-away on the Caribbean coast a few hours north of Chetumal. The staff rakes the beach in the morning, picks up leaves that fall in the night on the small areas of grass between the bungalows, and are cloyingly attentive. I haven't heard a word of Spanish from the clients. Mostly I talk to Rafael and the staff. The breeze flows hot Mexican across the water and the cash flows cold, hard American. It feels like Cancún in that someone had a great idea to give tourists (mostly North American) with money a place to sun and swim and forget their troubles, but not their amenities. There is such a dichotomy between here and the Yucatán that I love. I keep thinking these people should get to know México (I think the whole of the United States should get to know her southern neighbor better), but then who am I to insist on this? The only tourists I don't care for are the ones who are rude. Generally, those here in the resort are pleasant enough; they are just exclusive, as North America always seems to have been. The Statue of Liberty says, "Give me your tired, your poor..." but has insisted that once embraced by what Miss Liberty represents, those tired (who usually are not) and poor (who may not be) assimilate to such a degree that, within a few generations, most of the old ways are lost. We are left with a naiveté to outside experience and ignorance of other peoples. 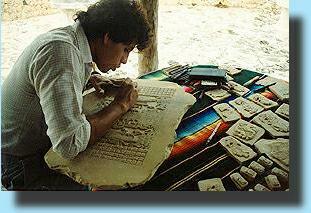 Rafael is an artist who carves Mayan symbols in limestone. 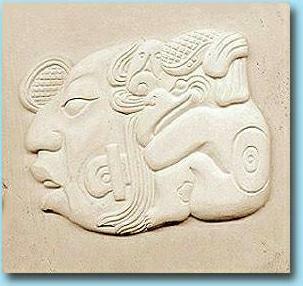 His works are reproductions of the glyphs found at Palenque. They are delicate, finely done, beautiful. He seems to know much of the myths and realities of the ruins. He uses many different hand-made knives, depending on the type of work being done. We spoke at length over the course of a couple of days. He is originally from Vera Cruz and has spent time in many places in México, Belize and Guatemala. Our conversation took on a life of its own, revolving around parapsychology and metaphysics. When I told him of my experience in Cenote Azul, he was not at all surprised at the story and said he believes in the power of the premonition. 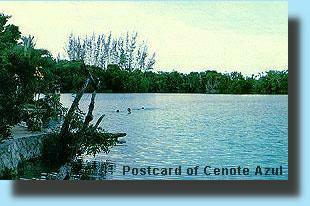 I replied that I still did not understand how I could have "seen" the cenote the first time so many years ago. Rafael looked at me and smiled, saying, "You know, there is no time." Here was a young Mayan man with no formal education telling me simply and clearly what Einstein espoused to the world through his theory of relativity. In that very still moment Rafael made perfect sense. Then he spoke of keeping the mind and heart clear and clean so these mediations may be possible. I told him that I love being on the Yucatán coast because not only is the exercise good, but the water is electric. He laughed and said, yes, yes, yes. Here in the middle of American prices, money and language, there is another bit of the Mystery. I am grateful for it. Just a short while ago a woman looked at Rafael's carvings and said, "How cute!" Thank goodness the artisan understands almost no English. Tomorrow I think I will buy one, at $25.00 US. They're extraordinary. It will be the only real present to myself, other than this trip itself. I did buy one of Rafael's pieces. It's exquisite; something to look at, something to touch: a Mayan profile carved on the surface of a thick limestone tile, with a sitting bird as the back of the head, all done in high relief. He gave me a discount, which I know was a token of his friendship. I wanted to support his artistry, and on a deeper level I wanted to take a piece of the Mystery with me back to the United States. It is a talisman of a journey I have dreamt of for a long time. It is the other side of my vision from years ago. The magic and mystery in the Yucatán is deep, ancient, alive. It breathes in the jungle, in the ruins; it breathes in the blood of the people. It is timeless.